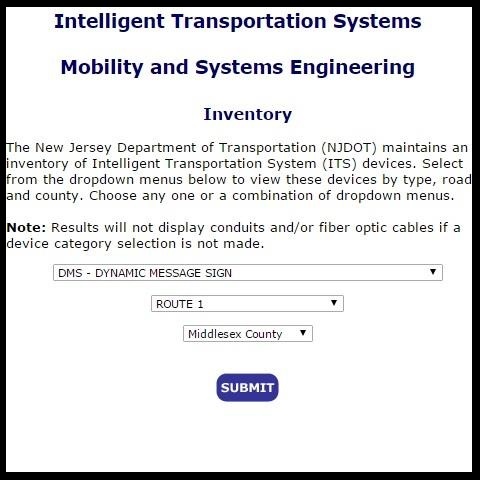 As part of our 3-year ITS On-Call Design Services contract with the NJDOT, AEA provided the NJDOT BMSE with an accurate database of the ITS devices inventory for the purpose of Managing their ITS device Assets. The database of information we prepared included ITS facilities and locations of communications systems currently installed throughout New Jersey, along with those under construction and those planned for construction the future. With the up-to-date data that was made readily available for review and evaluation in the database, the Bureau of Mobility and Engineering is better able to plan for design and construction engineering expenditures for State and Federal annual budgets, and to streamline projects in striving to meet the Division and Department annual goals. By helping the NJDOT to manage the lifecycles of their assets, BMSE is better equipped to develop project alternative strategies, and provide budgetary support to determine their highest priority and combined benefits. We have also recently prepared additional ITS Asset Management documentation for the NJDOT BMSE regarding their equipment communication hub sites located throughout the state. As part of this task we performed detailed field investigations to accurately document, verify, and update record drawing data and information so that the Department could better manage project development based on accurate data and information describing their existing system connectivity and operational status. The resulting records produced by AEA as a result of this work are use in all BMSE design and construction projects for the deployment of ITS devices and system expansion.